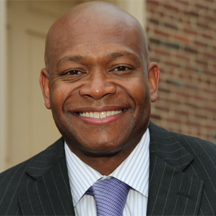 Born and raised in Baltimore, Robert Ware graduated from Woodlawn High School where he excelled in both academics and athletics. Excited about the possibilities the Air Force offered, he enlisted in 1983 and served at both Ramstein AB Germany and Dover AFB, DE. During his time on active duty Robert traveled throughout Europe and South America, immersing himself in many different cultures. He maintains a deep sense of gratitude for his time abroad and the experiences that help him to remain grounded and humble. Upon leaving the Air Force, Robert pursued his childhood dream of becoming a police officer, joining the New Castle County Police Department in 1997 and enjoying eight years on the force. Although he left law enforcement with a heavy heart, he did not abandon the mentality of a police officer – uphold the law and protect those around you. While still on the police force Robert decided to pursue his second childhood dream – to become a business owner. In 1999, he purchased Home Instead Senior Care, a company providing non-medical based, in home care services to those who desire it. These services include trips to the doctor, medication reminders, meal preparation, light housekeeping, errands, shopping, and even Alzheimer’s and dementia care – allowing seniors to feel safe and independent while they age in their own home. By providing a service that strives for excellence and being active in the community, Robert and his Home Instead team are changing the face of aging and helping to shape the direction of senior relations. Robert co-chaired the Alzheimer’s Memory Walk for many years, and became part of the 55+ Expo planning committee this year. Robert has always maintained a close relationship with his family. He learned his work ethic from his parents, who have been married for more than 50 years and remain active with work and volunteering. Robert’s son, Robert Ware III is a United States Marine, stationed in Japan. His daughter Jayla, will be attending Ceton Kehoe High School in Baltimore, Maryland on a music scholarship. Wendy Bryant wears many hats as the owner, head coach, and director at All Star Revolution. 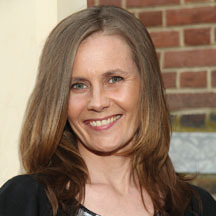 She was born and raised in Michigan and relocated to Delaware with her husband and four children in 2000. In Early 2000 while teaching at Lake Forest School District as a Para Professional Wendy attended Delaware Technical and Community College and transferred to Wilmington University to obtain degrees in Early Childhood Education and Education K-6 with a secondary in Special Education. All of the above experience is what has made her expertise with working with children in all realms and helped make her the successful owner and coach at All Star Revolution. Building each child’s confidence and helping each one to achieve individual goals while working together to build team work is the foundations of the great success at All Star Revolution and the relationship she shares with each of her cheerleaders. Wendy’s strong belief in dedication, putting the children first, love of children, and incorporation of a family atmosphere has made All Star Revolution the cheer-leading gym that all have come to enjoy. Wendy believes that all children are important no matter of their skill level, family background, age, or creed. Always willing to lead a helping hand she stands by the side of the families of which she works with. When not at the All Star Revolution cheer gym you can find her supporting her favorite driver and enjoying everything NASCAR with her husband and spending time with her 4 teenaged children. 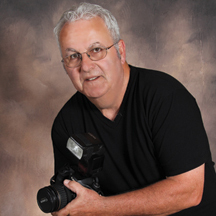 Mike Baker, owner of C.M.Baker Photography, has been photographing for at least 25 years. Over the years, he has earned such awards as “2010 Volunteer of the Year” from Kent County Tourism (in which he has become their “official” photographer for Dover Days). From the Central Delaware Chamber of Commerce (CDCC), Mike has also won the “Volunteer of the Year” along with “2008 Business Person of the Year” and the “2010 Chairman’s Outstanding Partnership Award”. For the past 3 years, he was voted Dover Post’s Photographer of the Year in one category or another. When Mike isn’t working with his cameras, he is always trying to learn something new to better his business. He attends many seminars with well known photographers, goes to Expos up and down the east coast and even local sitting in his office picking up a webinar or two every week. Mike feels that the learning process never stops. You might find C.M.Baker Photography doing a wedding one day and then flying over Delaware the next day taking aerials – a newer venture that he has embarked on over the past few years. Many other events also keep his schedule busy, whether it is a golf tournament for Harrington ERA Annual Charity or the well-known AHA Heartball Gala here in Dover. A new venture on his list is also green screen photography which will be shown in future issues. With wedding photography being his area of expertise, Mike will capture those special moments for you that will last a lifetime. C.M.Baker Photography will make your day fun and exciting and will help make it the most memorable day of your life. Remember experience goes a long way. Anyone can take a great wedding picture, but not everyone can take great looking pictures throughout the entire wedding. 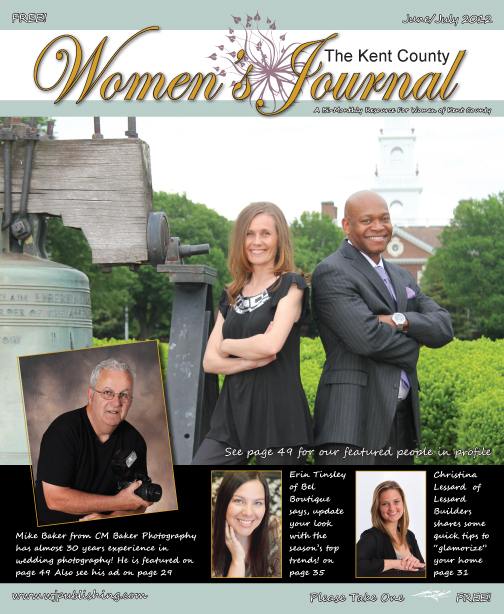 Special Thanks to Mike Baker for a wonderful cover shot, as well as being one of our featured people this issue. Hair and makeup were provided compliments of René Delyn Hair Designs, where they are committed to nothing short of excellence. René Delyn is a Master stylist with over 30 years’ experience in cosmetology. She is the owner and head stylist of Rene Delyn Hair Designs, and has received professional training all over the world. She is also a color educator for Goldwell Mid-Atlantic. René was appointed by the Governor to sit on the Delaware State Board of Cosmetology for 9 years where she helped regulate the laws of the salon industry. She is a state approved apprenticeship program provider. The team at René Delyn Hair Designs are proud members of the professional beauty industry…continually looking for ways to better their skills and learn new techniques.